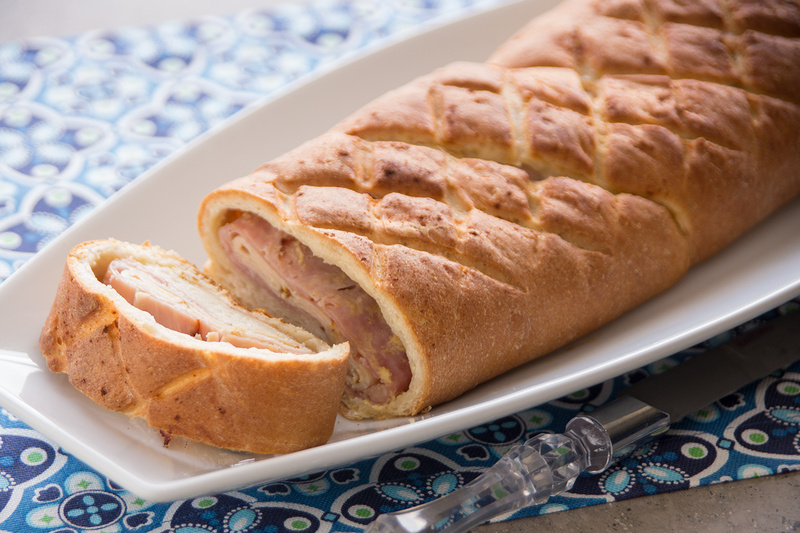 Favorite Cordon Bleu ingredients all wrapped up make this Stromboli a sure hit. Spray counter top lightly with non-stick cooking spray. Roll loaf or combined rolls into a 10×18-inch rectangle. Spread dough with butter and then with mustard. Top with ham, cheese and chicken. Sprinkle rosemary over chicken. Starting with a long side, carefully fold the dough over in thirds making sure the toppings stay in place. Pinch the seam closed, fold ends over the top and pinch to seal. Turn the Stromboli over and place on a sprayed baking sheet with seams on the bottom. With a knife, lightly score the top. Sprinkle with smoked paprika. Cover with sprayed plastic wrap and let rise for 30 minutes. Remove plastic and bake at 375 degrees F 25-30 minutes.